NEW YORK -- With all of the drama surrounding the Williams sisters, from the resurgence of Serena to the strange, debilitating illness that forced Venus to withdraw here, it's easy for the rest of the women's tennis field to feel overshadowed at the U.S. Open. But the Williamses are not the only ones who have been through turmoil lately. Ana Ivanovic, the No. 16 seed who will face Serena Williams in the fourth round Monday, has had her own share of misfortune, as well as triumph. There was the loss of her grandfather, Milovan Ivanovic, who died the weekend before the Open began. And the apparent reconciliation with Australian golfer Adam Scott, who was seen in the player's box for Ivanovic's opening-round match last Tuesday. "We're just happy," she told The Associated Press last week. Through it all, there has been the seeming return of Ivanovic's stellar tennis game. She has reached the fourth round here after beating top American prospect Sloane Stephens on Saturday night, marking the Serbian's best performance in a Grand Slam in 2011 after first-round exits at the Australian and French Opens and a third-round departure at Wimbledon. The player who was ranked No. 1 in the world after winning the French Open as a 20-year-old in 2008 may not have vaulted back to the top just yet. But at least Ivanovic, ranked 19th, appears on her way again. "Well, I think with all the work I've done, you do gain confidence," Ivanovic, 23, said after beating Stephens 6-3, 6-4 in Arthur Ashe Stadium on Saturday. "Obviously when you win, you have more confidence, you enjoy competing much more. That's something that I gain back. … It makes a big difference because you don't doubt so much when you step on the court and you can play a lot freer." In her rise to No. 1 in 2008, Ivanovic captivated as much with her appearances as her on-court performances. 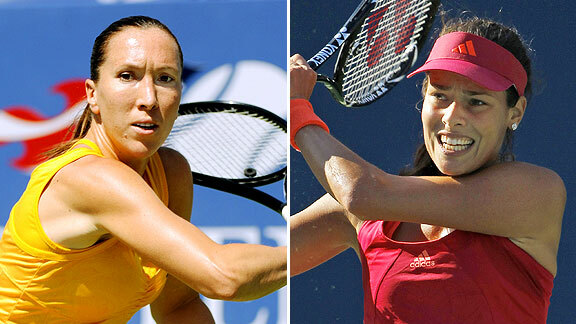 What followed was a mystifying rapid plummet; at her lowest, Ivanovic's ranking dropped below 60 in the summer of 2010. "For me, it was one of the strangest things because she won the French Open playing so well, became No. 1 in the world, and I don't know if it was the weight of the pressure, the expectations of now being at that level," said 15-year pro and two-time doubles Grand Slam champion Mary Joe Fernandez, now a tennis commentator. "Majors have been tough for her. So for her already to come through this far, I think that's already going to give her a big boost and belief. Part of the credit for bringing those pieces back together goes to new coach Nigel Sears, the former head of women's coaching for the British Lawn Tennis Association who became Ivanovic's coach in July. Sears has worked on Ivanovic's powerful forehand and serve. "He has helped me a lot," Ivanovic said. "I think our relationship, it's really good. I can pick up things fast from his coaching. We have the same views, and that's very important as well, because then you can absorb things better. "We have big goals and we look at the big picture. But the results are already there, which is very encouraging." Ivanovic also has not been severely tested at the Open thus far. She beat Ksenia Pervak of Russia 6-4, 6-2 in the first round and had a second-round walkover against Petra Cetkovska of the Czech Republic, who beat her in the third round at Wimbledon. Ivanovic then took advantage of a young Stephens, 18, who was so overwhelmed to play in Ashe Stadium for the first time that she battled nerves as much as her opponent. But the path ahead can't be any more difficult for Ivanovic now. She faces Williams in Ashe Stadium on Monday. Williams has not surrendered a set through the first three rounds. She has lost just 10 games overall. "When you play Serena, Serena controls the match," Fernandez said. "It's up to Serena. If she continues to play the way she's playing, I don't think anybody can beat her. But for Ana, it's going to be key to serve well. She's going to have to serve well to be in it." For her part, Williams knows Ivanovic is improved from earlier in the season. "Well, she's playing well," Williams said. "She's incredibly fit right now. She was No. 1, right, at one point, so …"
So Ivanovic is not a player to be taken lightly at this moment. Still, Ivanovic knows what's coming. But if she is intimidated, it doesn't show. "It's exciting, at least for me," Ivanovic said. "I think she [Serena Williams] is the hottest player out there at the moment. She's been playing so well lately. It is going to be a good challenge. "I know I can give her a tough match. She beat me in the past, but maybe I can go for revenge on Monday." Ivanovic has nothing to lose. Even if she doesn't beat Williams, she already knows she's on her way back to the upper echelon of women's tennis. Viv Bernstein is a freelance writer based in Charlotte, N.C., a Yankee transplant in a Bible belt town that is home to Billy Graham's library, banks, stock-car racing and that signature Southern culinary abomination: Barbecue. Over the years, she has written for many publications and web sites, covering everything from the Super Bowl to the Daytona 500.